Select a circuit from the drop-down list box in the top button menu bar. These instructions will show you how the basic circuit operation works. 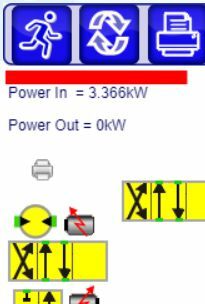 Move the mouse over each component to see its type name, size, and setting displayed just below the top menu bar. Left click on the solenoid to operate the valve. The right and left solenoids shift the spool one way or the other. 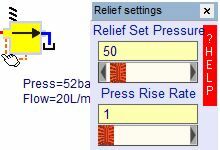 Click and drag the test gauge over an object or pipe to see the conditions inside. Or left click on the object. The pipe flow may show as both positive and negative. This is because the program checks both directions along the pipe and looking in one direction it will be positive and the other direction negative. Left click on a component to open its data window. Select the type of valve and settings from the drop-down list. Drag the small printer icon onto (or under) a component. Press the large printer button in the top menu bar to open the results window. Press the large print button every time you wish to take a new reading. Copy and paste (as .csv) results into a spreadsheet to plot a graph. Click the �tools' button at top left of the menu bar. The simulation will stop. Click and drag components and pipes to move them. New pipes grow from the single dots and must be located very close to the green dots. When finished press the refresh button to redefine the circuit. The circuit can only be saved in the .exe version. Press the run button to test your new circuit.